More than USD $109 million has been pledged so far in connection with the star-studded September 5 Stand Up To Cancer (SU2C) “roadblock” fundraising telecasts in the U.S. and Canada, it was announced today. In the U.S., SU2C is still gratefully accepting donations at www.su2c.org and at 1-888-90-STAND (78263). The telecast is available here. As in 2012, the broadcast was executive produced by Gwyneth Paltrow and Joel Gallen of Tenth Planet Productions in collaboration with SU2C’s production team. ABC, CBS, FOX and NBC, along with ABC Family, American Forces Network, AXS TV, Bravo, Cooking Channel, DIRECTV, Discovery Fit & Health, E!, Encore, Encore Espanol, EPIX, ESPNEWS, FOX Sports 2, FXM, HBO, HBO Latino, ION Television, LMN, Logo TV, MLB Network, National Geographic Channel, Oxygen, Palladia, Pivot, SHOWTIME, Smithsonian Channel, Starz, TNT and VH1 donated one hour of simultaneous commercial-free primetime for the nationally televised fundraising special on Friday, September 5, broadcast live from the Dolby Theatre in Los Angeles. The show also streamed live on both Hulu and Yahoo, and is still available on each. For the first time, there was a Canada-inclusive co-broadcast of the telecast, which aired simultaneously on all four major English-language Canadian networks: CBC, City, CTV and Global, along with Canadian services AMI, CHCH, CHEK, Fight Network, Gusto TV, Hollywood Suite and TLN. In addition to Paltrow, Kareem Abdul-Jabbar, Camila Alves, Jennifer Aniston, Kevin Bacon, Justin Bartha, Halle Berry, Jordana Brewster, Pierce Brosnan, Steve Carell, Dane Cook, Bradley Cooper, Katie Couric, Brittany Daniel, Amanda de Cadenet, Giada De Laurentiis, Zooey Deschanel, Robert Downey Jr, Ben Falcone, Jesse Tyler Ferguson, Will Ferrell, Josh Gad, Tony Goldwyn, Topher Grace, Dave Grohl, Kathryn Hahn, Tony Hale, Jon Hamm, Angie Harmon, Mark Harmon, Neil Patrick Harris, Marg Helgenberger, Anna Kendrick, Rob Lowe, Joe Manganiello, Danny McBride, Melissa McCarthy, Matthew McConaughey, Maria Menounos, Mike Myers, Olivia Munn, Matt Passmore, Italia Ricci, Rob Riggle, Mira Sorvino, Hailee Steinfeld, Ben Stiller, Emma Stone, Eric Stonestreet, Alison Sweeney, Justin Theroux, Bree Turner, Sofia Vergara, Charlie Wilson, Reese Witherspoon, and Ethan Zohn participated in the telecast, as did MLB players Jose Bautista, Miguel Cabrera, Paul Goldschmidt, Derek Jeter, Adam Jones, Jon Lester, Giancarlo Stanton and Mike Trout; The Who; the Dave Matthews Band; Ariana Grande; and Lupe Fiasco with Jennifer Hudson and Common delivered one-of-a-kind musical performances. Yahoo News Global Anchor Katie Couric, who is a Stand Up To Cancer co-founder, hosted an On-Stage Digital Lounge, where participating actors and personalities stood the notion of the traditional ‘phone bank’ on its head via “We’re Calling You,” reaching out to supporters via social media and by making phone calls. The show helps fund SU2C’s groundbreaking approach to translational research, accelerating the delivery of new therapies to patients by getting them from the “bench to the bedside” as quickly as possible. SU2C brings together scientists from different disciplines across various institutions to work collaboratively, rather than competitively. In the U.S., 100 percent of the donations received from the general public go directly to collaborative cancer research programs. All funds received from the Canadian general public during the broadcast will be directed towards the creation of collaborative research teams, as well as education and awareness programs conducted in Canada. Pierce Brosnan, who lost both his first wife and his daughter to ovarian cancer, announced during the show that SU2C will work with ovarian cancer organizations to launch a “Dream Team” dedicated to developing new therapeutic interventions for what he called “this wretched disease,” which is expected to take the lives of over 14,000 women in the United States this year. Partnering with SU2C are the Ovarian Cancer Research Fund (OCRF), Ovarian Cancer National Alliance (OCNA), and National Ovarian Cancer Coalition (NOCC). Later this month, SU2C will issue a “call for ideas” for the SU2C-OCRF-OCNA-NOCC Ovarian Cancer Translational Research Dream Team grant, which will offer up to $6 million in research funding over a three-year period. Also, SU2C will work with the American Cancer Society (ACS) to launch a new research initiative on lung cancer. The call for ideas to the scientific community for the lung cancer Dream Team will be issued later this month. The broadcast included inspiring stories of people living with cancer who have directly benefited from the type of groundbreaking, translational research that is encouraged and supported by SU2C. When she was diagnosed with stage III ovarian cancer, gallery owner Beverly Reynolds discovered her cancer was resistant to the standard chemotherapy treatment. Reynolds subsequently enrolled in a clinical trial conducted by members of the SU2C PI3K Dream Team. After just eight weeks on the clinical trial, Reynolds showed a dramatic response to the treatment. “Her participation on this trial has allowed us to reverse the growth of the cancer, so now it’s shrinking. And that’s translated into her feeling better and being able to do things she would not have been able to do had she not been on this trial,” said Dr. Ursula Matulonis, M.D., Medical Director of Gynecologic Oncology at Dana-Farber Cancer Institute and one of the doctors on the PI3K Dream Team. Nine year-old Emily Whitehead was the first pediatric patient ever to receive an experimental immunotherapy for acute lymphoblastic leukemia (ALL), after she relapsed a second time following standard chemotherapy. The new treatment involved extracting T-cells from Emily’s blood, reengineering them specifically to attack her cancer, and reinfusing them into her body. In just a few weeks, Emily showed a complete response to the therapy, and remains cancer-free today. Ninety percent of the childhood cancer patients who have received the same immunotherapy as Emily showed a complete response like her. One of the goals of the SU2C-St. Baldrick’s Foundation Pediatric Dream Team is to understand why the other ten percent of patients do not respond to the therapy, and if anything can be done to make it effective for them. “Our program honored all those we’ve lost to cancer, emboldened those brave survivors among us to continue fighting, and showcased SU2C’s remarkable progress through the prism of patients who have benefitted from research. The results are tangible, and the potential for breakthroughs in the coming years is very exciting,” said SU2C CFA member Ellen Ziffren. Every day, cancer kills 1,600 Americans – one person every minute. In 2014, more than 585,000 Americans and almost 8 million people worldwide will die of some form of cancer. 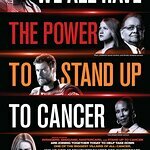 SU2C was founded on the belief that we are at a pivotal juncture with the potential for transformative progress in cancer research because of two trends: breakthroughs made in our understanding of the basic science of cancer, and technological advances that enable us to translate them into new treatments. Today’s cancer researchers need additional funding to fulfill the promise of life-saving discoveries, and Stand Up To Cancer engages the public to support their work.